Today in Pittsburgh, Clique Vodka was featured on the morning show Pittsburgh Today Live! On that show, our lead Mixologist Tara Shinn showed viewers how to create some delicious holiday cocktails. You can view the segment HERE! Below are the two cocktails featured on that segment. 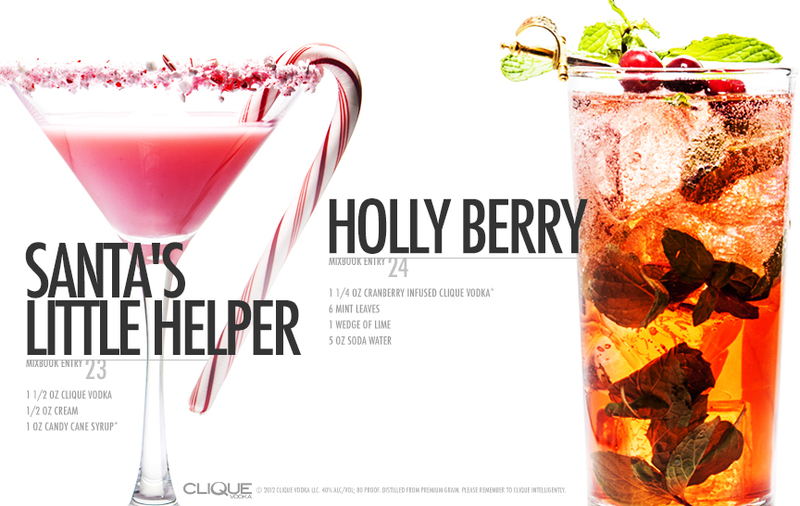 Now you can make these two delicious cocktails at home this holiday season! Check out the recipes below! Rim a cocktail glass by dipping the rim in a small pool of candy cane syrup, and then dip in crushed candy canes. Shake Clique Vodka, cream and candy cane syrup over ice and strain into the glass. *For the candy cane syrup, crush 12 candy canes and melt in 1 cup of boiling water. Expert Tip: to crush the candy canes, just put then in a baggie, and roll with a rolling pin. Shake cranberry infused Clique Vodka, mint leaves, and squeezed lime wedge over ice and strain into a tall glass with fresh ice. Top with soda water and garnish with cranberries and mint sprig. *For the cranberry infused Clique Vodka, just cut 6 oz of fresh cranberries in half and cover with 1 bottle of Clique Vodka for 2-3 days. Expert Tip: Hold the mint sprig in your palm, and smack it firmly with your other hand to push the aromatic oils through the leaves before garnishing.